AnswerGarden » Punctuation ...- Plant a Question, Grow Answers! Generate a live word cloud with your audience. Share this AnswerGarden on various social networks using the following buttons. Use this link to refer to your AnswerGarden. 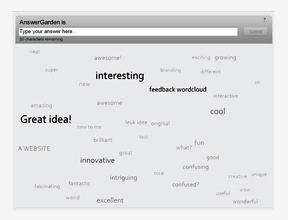 MicroGarden is a very compact HTML5 answer field for AnswerGarden which can be used to gather user data. You can use MicroGarden for polling without showing the results (a blind poll). The answers show up in your AnswerGarden. See the image on the right, click it to try it out. No answers in this garden...this means there's nothing to export. Please confirm your password to access the admin panel for this AnswerGarden.